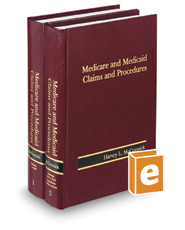 Focusing on the most frequently used sections of the Medicare and Medicaid Acts, Medicare and Medicaid Claims and Procedures guides you through the Medicare and Medicaid claims processes. This reference guide organizes laws, regulations, and court decisions in a practical, user-friendly fashion. Appendixes contain useful, time-saving practice aids including lists of Medicare forms, fiscal intermediaries, Medicare carriers, Medicare quality improvement organizations, and state medical assistance contacts.